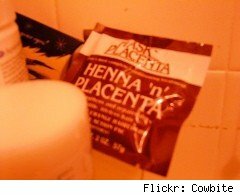 When I read a story about the use of placenta in cosmetics on Inventor Spot Blogs today, I assumed it was an April Fool's joke. Turns out, the joke was on me. The Russian company Plazan, which claims J-Lo among its customers, openly states that human placenta is a key ingredient in its line of lotions, creams, lipstick and face masks. According to the company, human placenta provides amino acids, activated peptides, vitamins, minerals, sugar, enzymes, nucleic acids and growth factors. Best of all, to some -- it's all natural. According to Time Magazine, Plazan is only one of dozens of cosmetics companies that use placenta. However, most keep its use under wraps, fearing a consumer backlash. Makes you wonder about the list of ingredients on your favorite face cream, doesn't it? While I wouldn't think this use of human tissue would be as controversial as stem cell research, the notion of using placenta to reverse the aging of my skin isn't very appealing. I am, however, not averse to enjoying the results on J-Lo's appearance.